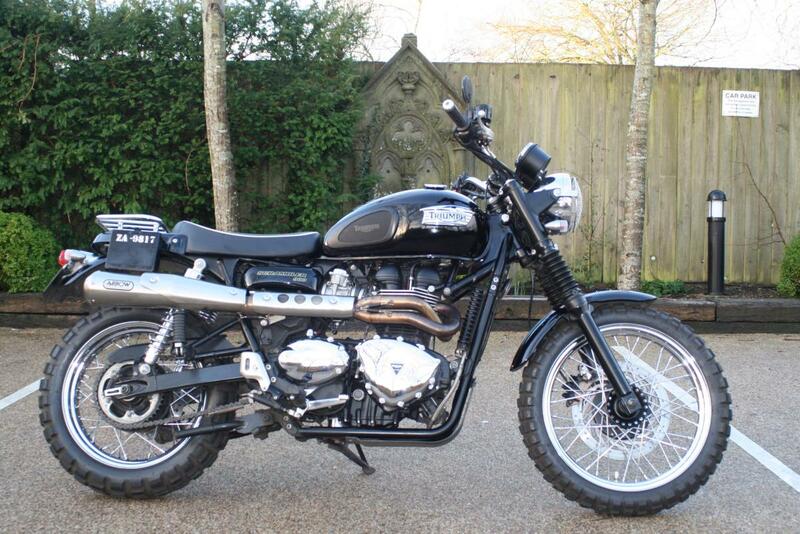 We are thrilled to be able to offer you this 4 owner TRIUMPH BONNEVILLE 865 SCRAMBLER. Full service history, supplied with 12 months MOT and offered in excellent condition. The noise is to die for. Small children and the elderly beware, this has teeth!Visually the most arresting of the retro Bonneville range, the Triumph Scrambler also makes a great all-round everyday bike. Dream of being Steve McQueen in the Great Escape as you zip down to Tesco's on your cool Triumph Scrambler, just don’t go try to jump the checkout queues! Straightforward, old-fashioned steel tube double cradle with twin shock rear end, it’s dinky, easy going and novice friendly, but more importantly the Triumph Scrambler looks the part too and is comfy for short to medium trips. Low rate finance is available on this bike, credit subject to acceptance. For a no obligation finance quote, please call 01747 811196 and select option 1 for sales. Thanks for looking! !